The Gnome 3 comes with the old gnome-screensaver which is just a blank screen. XScreenSaver is a collection of about two hundred free screensavers for Unix, Mac OS X and iOS. It was created by Jamie Zawinski in 1992 and is still maintained by him. 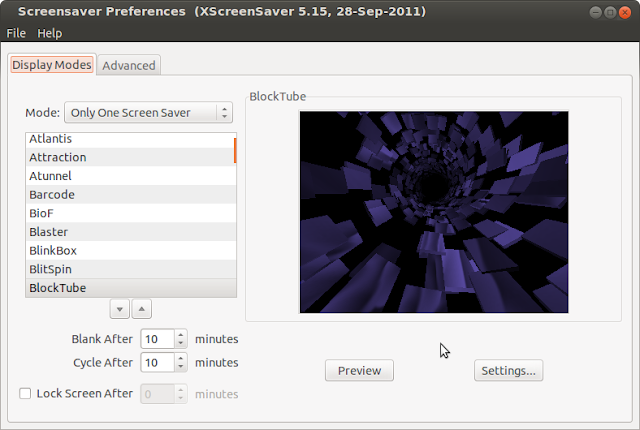 The free software and open source Unix-like operating systems running the X Window System (such as Linux and FreeBSD) use XScreenSaver almost exclusively. On those systems, there are two parts to XScreenSaver: the collection of screen savers; and the framework for blanking and locking the screen. In recent years, some Linux distributions have been using the gnome-screensaver or kscreensaver screen-blanking frameworks by default instead of the framework included with XScreenSaver. They still depend on the XScreenSaver collection of screen savers, which is over 90% of the package with the exception of gnome-screensaver version 3 and onward, which has dropped support for screensavers completely, supporting only simple screen blanking. One reason for XScreenSaver's popularity is the modularity of its design, which makes it easy to add new display modes. The display modes (termed "hacks" from the historical usage "displayhack") are each stand-alone programs invoked by the xscreensaver daemon. In this way, a third-party screen saver can be written in any language or with any graphics library, so long as it is capable of rendering onto an externally-provided window. Click OK to both prompts asking to turn-off Gnome Daemon and to start xscreensaver-daemon respectively. If you want few more screensavers for ubuntu you can install rss-glx (Really slick screensavers for GLX port). rss-glx is a GLX port of the really slick screensavers collection.The screensavers can either be run as stand-alone applications or integrated into the Xscreensaver.